It’s fair to say that at times, my coffee tasting lags slightly behind my coffee acquisition. There are some times when I’m down to my last bag, but more often there’s a half-dozen different coffees lurking in the cupboard, waiting to be tasted. That’s generally fine, because coffee – even ground coffee – keeps pretty well, especially in our relatively cold kitchen. It’s a little more complicated when it’s coffee from Pact. While I love the fact that there’s always something new to try from them, they have an unfortunate habit of removing the detail of older coffees pretty swiftly after they’ve sold out. Makes sense if all you want to do is to buy some coffee from them, but frustrating if you want to know a bit more about the packet that’s been languishing in the cupboard for a couple of months. Still, Google usually answers most of my questions in the end. 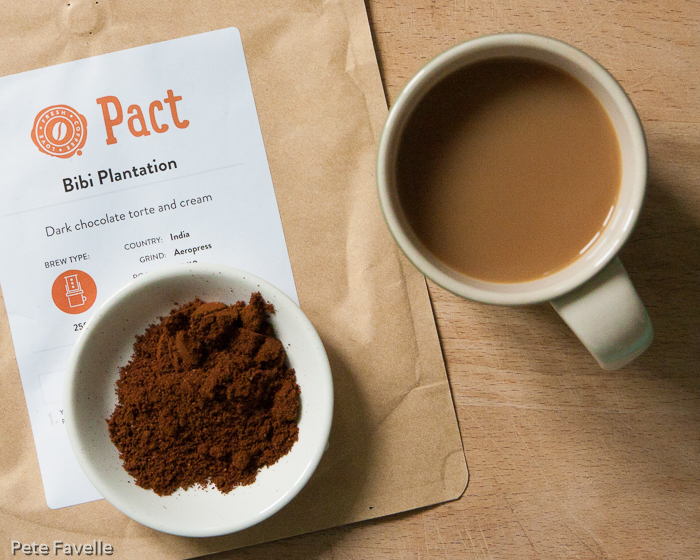 Bibi Plantation is an Indian coffee, specifically in the state of Karnataka. This is in the south west of India, and grows more than half the coffee produced in the whole country. The ground are relatively pale and have a light, fresh aroma – sweet lime, light caramel and a tempting creaminess. Brewed, the light fruits remain but they’re joined by some dark chocolate. It’s relatively light in the mouth too; gentle citrus softened further by a creamy body and little hints of chocolate. While definitely on the lighter side of roast, the creaminess in the body makes it a more substantial coffee – not as rich as my usual tastes, but a very enjoyable daytime option. 3.5 stars.